The Jamestown Renaissance Corporation is excited to announce the successful pilot launch of the Jamestown Mobile Market. Starting August 8, the innovative food access project serviced the Jamestown area over an 8 week period. Defined as a ‘farmers market on wheels’, mobile markets have been established across the country in an effort to increase healthy, whole foods access in low-income neighborhoods. Thanks to the Farmers Market Promotion Program, USDA federal funding, the Jamestown Renaissance Corporation has spent the last year planning and implementing a mobile market program servicing residents of Jamestown. “Mobile markets serve communities to great success in cities across the US, including Buffalo, Rochester and Syracuse. Jamestown has incredible access to fresh produce due to our proximity to local farms, and a mobile market was the next logical step as we looked to expand the Jamestown Public Market, and with it food access,” states Public Market Manager Linnea Carlson. 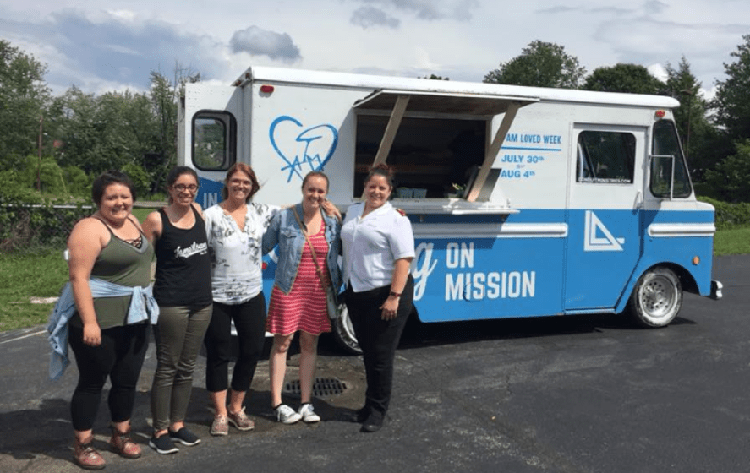 The Jamestown Mobile Market completed an 8 week season, visiting four separate locations within the city: the Salvation Army of Jamestown, the Gateway Center, Tree of Life Lutheran Church, and Crestline Villa. Each week volunteers assisted in picking up produce from area farms, organizing and packing the fruits and vegetables, and distributing food to community members via a partnership with Conduit Ministries. Thanks in part to a sponsorship with United Healthcare, community members could utilize $5 coupons to access five different fruit and vegetable servings per market day, or purchase additional produce with cash. Eat Smart WNY and the Office of the Aging provided food tastings and easy recipes and produce freezer tips for customers. Community members also donated to customers freezer bags and mason jars for food produce storage. United Healthcare visited each location to distribute information on their benefits as well as reusable shopping bags. Produce was acquired from three area farms, Hidden Valley Produce of Frewsburg; Abers Acres of Kennedy; and Steady Plow Farms of Sherman. Produce available varied from sweet corn, green beans and potatoes, to more unique options such as ghost peppers, black cherry tomatoes, and purple sweet peppers. Mobile markets benefit an entire community, providing access to fresh fruits and vegetables to those who may work or live in areas lacking fresh produce, while increasing profits for local, family farms. Jamestown resident Virginia Storres, is just one of the many individuals impacted by the project, sharing “The mobile market helped me eat more fruits and vegetables; I used to eat bags of chips and now I want tomatoes! I have really experienced a lifestyle change because of the program.” A total of 714 customers visited the mobile market. Produce not distributed was donated to the Salvation Army food pantry or St. Susan’s Soup Kitchen. The Jamestown Mobile Market will launch its second season in June of 2019. The aim, according to Carlson, is a longer season, more market locations, and an increase in individuals served. The market plans to accept SNAP benefits in the future and continue partnerships with local organizations, churches and non-profits.